The Panasonic BT-LH80WU Multi-Format LCD is a 7.9" color display/viewfinder designed to be used for high definition field monitoring. The display boasts features usually not found on LCDs of this size, including pixel-to-pixel and focus-in-red functions. 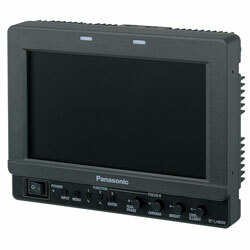 The monitor can also be interfaced with a variety of Panasonic series cameras through a direct 15-Pin viewfinder connection. In addition to its wide array of features, the BT-LH80WU can be mounted side-by-side in any standard 19" rack system.